Taking a shower the other day, I realized I just had to tell you about my OXO Good Grips Shower Caddy . I love it! Does your shower caddy slip and fall off? The OXO Good Grips Shower Caddy never does! Do all your shower necessities fit? They certainly will in the three tiers of the OXO Good Grips Shower Caddy ! 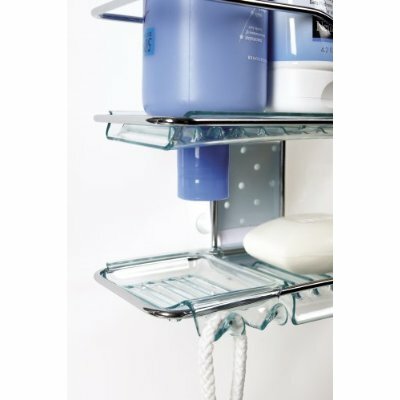 The OXO Good Grips Shower Caddy has little holes that allow you to put upside down bottles–and they’re stable! You will never spend your shower chasing runaway mostly empty bottles again! Man, you were pretty enthusiastic to have your shower interrupted by a product review. Normally I’d be pissed.